Imagine how much time and manpower you'll save when SymHarvest completely automates the check-in process for hunters reporting their harvest. It's on the job 24/7, for both hunters and enforcement officers. 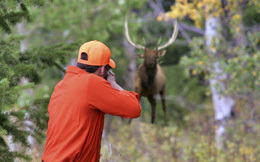 It tracks quantities and locations of game killed, making compliance with federal mandates a breeze. And it shortens the post-season data collection process from months to a single day.